Homeschooling can be done in the greatest simplicity which is one of the beauties of it. But, there is nothing stopping us from throwing ourselves into more daring projects! This is exactly what happened when Nancy Roy, a member of HSLDA, decided to throw herself into an unforgettable and enriching experience with her homeschool group. Nancy belongs to a homeschool group in Granby, Québec. A small group of about 5 families that are regularly involved, and parents take turns organizing an activity of their choice. A few months ago, it was Nancy’s turn, and she had the idea to set up a project about elections. To do so, she accessed some pedagogical resources that Elections Canada has made free to the public. So, the first activity was organized with the help of the kit, Choosing Our Mascot. This kit, designed for students from Kindergarten to Grade 4 includes the information and materials required to conduct a mock election. The children must choose which animal will be the mascot for the group, from a choice of 5. The activity was enjoyed by the students, who were impressed with its realism. The kit includes everything necessary to dive into the electoral universe of adults, including a polling booth, a ballot box, and ballots. Sam the wolf was the happy winner of the election. This election allowed the children to learn a lot about democracy, including certain subtle mechanisms. Some of the young people were quite vocal about the candidate for whom they had voted, which provoked grumbling from some other voters. The children and their parents then learned the importance of keeping their vote secret! Since the homeschool group had participants age 4 to 15, another activity also took place to include the older ones. This time, they used the kit, Canada at the Polls! While organizing this activity, Nancy decided to add an exciting bonus. 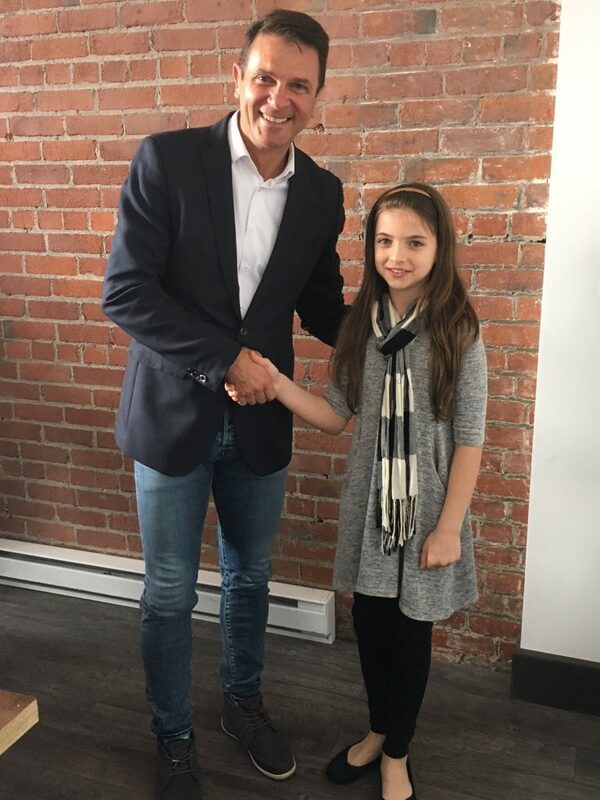 Since the goal was to elect a student to represent the group, why not permit the winner to meet and interview the Member of the National Assembly (MNA) from the provincial government of their region! This was the challenge for their little group. Three young people, all elementary-school age, rose to the challenge and presented their candidacies. At the end of the electoral process, it was Abbie, Nancy’s daughter, who was chosen by the group to represent them (Nancy insists that the election was not “rigged”. All was done according to the rules of democracy!). Abbie was surprised and thrilled to be the chosen candidate. As her mother explained, this experience gave her a boost of pride and self-confidence. But, with privileges come responsibilities. Abbie then had to collect the questions from her fellow citizens that would be asked of this MNA. And, she had to face stage fright for this ultimate meeting! 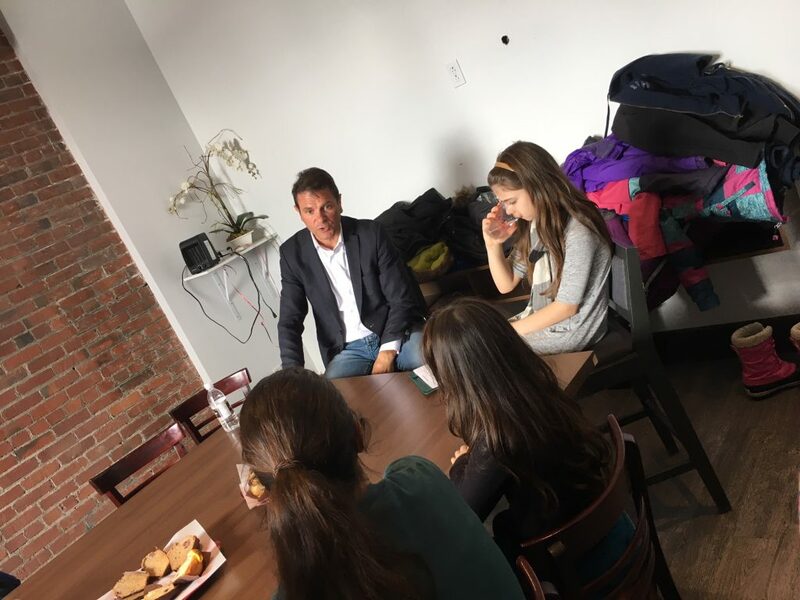 On March 12, the MNA,François Bonnardel, of the Coalition Avenir Québec met with the homeschool group. Since this was an important event involving a public personality, why not add a little ‘jet setting’ touch to the meeting? Consequently, the children and their parents met him at the Presse-Café in Granby where Abbie interviewed him. Mr. Bonnardel, MNA, got to know the homeschool group in Granby. The meeting, which lasted approximately an hour and a half, proved to be very valuable for everyone. The homeschool group had the opportunity to meet this political man who was obviously used to being under the microscope. He quickly put everyone at ease and he turned out to be good company. As for Mr. Bonnardel, he had the opportunity to meet students who surprised him with the pertinence of their questions and their knowledge of the subject matter. In all his political career, this was only the second time that he had been invited to meet a group of students. And, he had never met a group of homeschoolers. This wonderful initiative gave him the opportunity to better understand and appreciate the work of parent-educators. The MNA answers the children’s questions. In the end, Abbie handled her interviewer role very well. 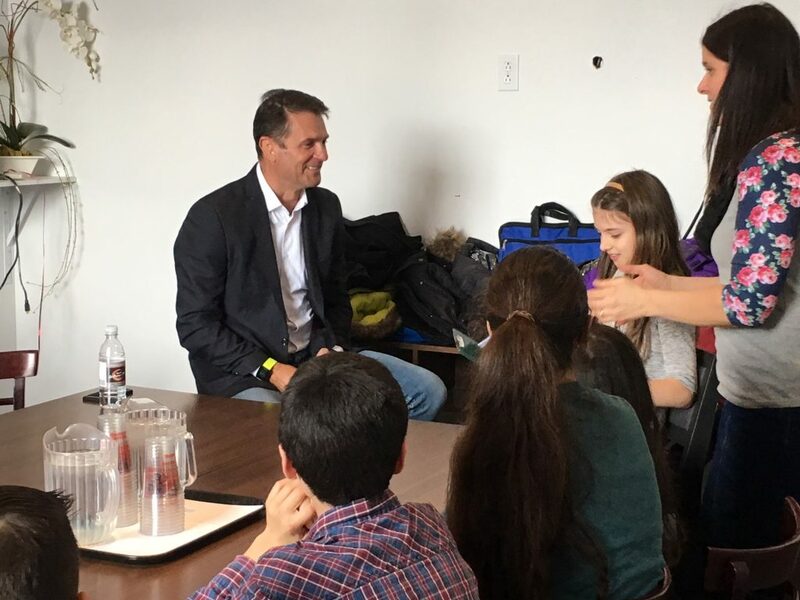 The MNA responded to a wide variety of questions, ranging from: the candid questions of the little ones (for example, “How do you manage to not be shy?”) to the questions of the older ones (for example, “If you could, what law would you like to change?”). 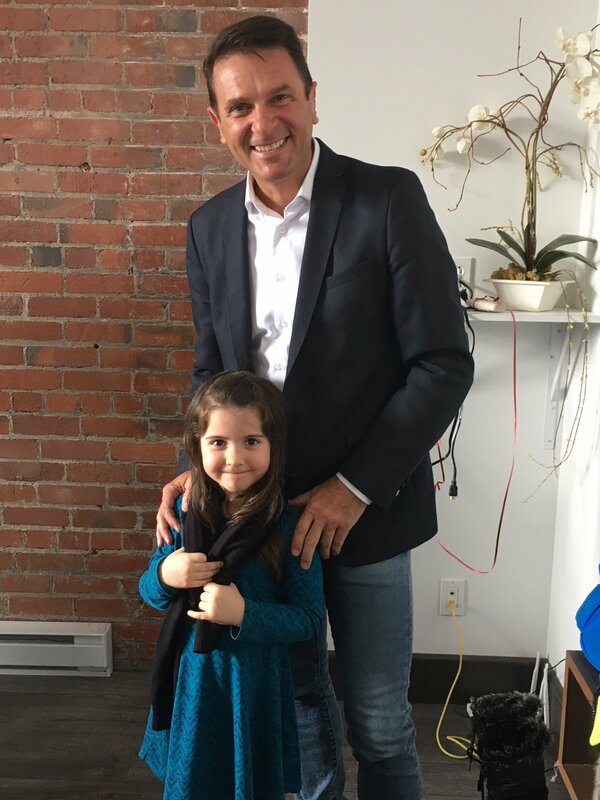 Mr. Bonnardel enthusiastically played along and concluded the activity by meeting the parents, who took advantage of this opportunity to discuss the issues pertaining to the new legislation of the Québec Education Act. The winner of the Granby homeschool group elections shakes the hand of the electoral division of Granby. If you, as a parent-educator or as part of a homeschool group, have accomplished an activity you would like to share with our community, don’t hesitate to let us know by writing to info@hslda.ca. Your story will inspire other parents and show them in a practical way how homeschooling is an enriching educational avenue with unlimited possibilities. If you would also like to benefit from the educational resources offered free of charge by Elections Canada, click here.